Snack Girl has become a Greek yogurt expert. She has sampled them all and got excited when a new one appeared in the dairy case. Muller (with cool punctuation) has the same packaging as my favorite, FAGE. When I saw it, with its cute yogurt compartment and topping compartment on the side, I got excited. I was also thrilled with the price 4 for $5 which is quite a bit less than the $2 FAGE. I also liked the idea of adding caramelized almonds to my yogurt. Super yum! You are probably going to think this is funny, but I’m one of the few people out here that writes consistently on Greek yogurt. I know this because I have been interviewed for major newspapers on the subject, therefore I am a self-appointed expert. Do you see the milk protein concentrate, whey protein concentrate, modified food starch, and kosher gelatin? Those additions mean that this is not a true Greek yogurt but a “Greek style” yogurt. The package does say “Greek style” in teeny weeny print (see above and take out your magnifying glass). The additives are extra protein to make it high in protein like real Greek yogurt and gelatin plus starch to make the yogurt thick. FAGE contains only milk and yogurt cultures. Ahh, FAGE how I love you! Muller is trying to capitalize on FAGE’s success by making a cheaper version. How does it taste? It does taste better than Yoplait Greek, which I hated. It is a treat with an average of 21 grams of sugar per five ounce container (don’t get me started). I would give it a 6 on a scale of 1 to 10. Have you seen this new brand? What do you think? Thank you for this info! Just read about this in Rachael Ray's mag as being a good choice, that sugar is through the roof!! Woooooohhhh!! I had no idea! I actually have never had it! I'm a fan of Fage, Chobani and Trader Joe's Greek Yogurt, so I haven't changed. I am so glad you pointed this out! I will never try this yogurt! !They are such sneaky B's! They were giving samples out at the store one day and I thought it was good and then I looked at the ingredients and nutritional facts and said, no thanks. Have you tried Greek Gods yogurt? I fell for this one last week (had a coupon). It's tasty, but once I actually read the ingredients - too late - I felt like a dummy. Never again. Hannaford stores have their own brand (Inspirations) that is pretty good. I think it's 3 or 4 WW points per container, and at 95 cents each it's affordable too. Quaker is ripping us off with this one - not nice of them! You know I just stay away from flavored greek yogurt because of the sugar content. I just bought the large tub of plain Great Value greek yogurt this week and I must say its great! I think all the ingredients stand up to what we are looking for as well. Give it a try, it sure is cheaper. I must say I have become quite the Chobani fan lately. The best option for "Greek" yogurt is to get it at a middle eastern store if you have one close to you. It's not only all natural but it's also affordable. I get one called Ziyad (www.ziyad.com). They have it in 32 oz., for $2.99 or 64 oz., for $5.79. You can't get any better than middle eastern yogurt unless you make it yourself. It is super tasty alone or topped some honey and walnuts. Getting a pretty package of "greek yogurt" is often not all that it's made out to be! Izabel - thanks for that information, I will definitely look into that. Thanks for pointing that out! I would've missed it! It's funny cause I was eating some yogurt when I started reading this. I just learnt about the goodness of greek yogurt and have been buying it but didn't really know what to look out for. Ofcourse I went to the fridge to check and it appears I made a good choice. I purchased the liberte brand (plain non-fat). I was kinda cheating with it though. I had sweetened it with honey. I am currently on the South beach diet phase 1. I really deserve it, it's been a tough week. My fitness expert friend has a good suggestion on how to flavour your yogurt. If you keep frozen fruits like berries, you can put them in the yogurt overnight and that makes a yummy snack as well. I like okios, lovvve fage, and ive recently found liberty is really good too! Personally, I'm a fage believer. I add fruit or peanut butter to the plain kind and even like to use it in recipes (like dips and baked goods). I have found that it seems to be the highest quality so I'm generally ok with the high price tag. When I saw this new muller product, I immediately looked up the nutrition labels and knew right away it was not for me. Now, because of this post, I'm even more convinced it's not for me. Thanks for the info! Thank you! Love this kind of info!!!! In an attempt to get my daughter to eat a healthy yogurt, I bought Muller and I was pleased that she liked it. When I went to throw the container out, I looked at the back and my jaw dropped when I saw how much sugar was in it. That was the first and last time we got it. At this point, I rather her eat hard boiled egg whites with salsa (which she loves) to get her protein than this sugary, Greek yogurt wannabe. Like you, I'm sticking with Fage which is hands down the best one out there. Chobani tastes like sour cream and does not have a nice texture. Seriously, grocery shopping takes so long these days now that you gotta get out your magnifying glass and scrutinize every label! 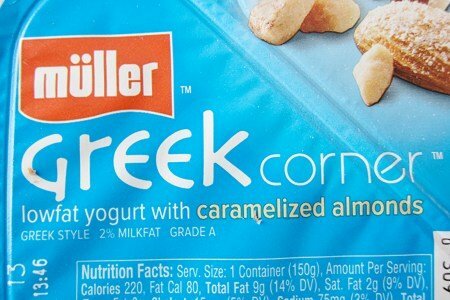 I've never considered Muller a very healthy yogurt with all that sweet stuff going on in the corner. I think it's funny that they call it a "Greek Corner" like it's only Greek in that part! And wow, that's a ton of sugar. Think I'll stick to my Costco Greek...once I check the label and make sure it's not fake! @ Jeff, Greek Gods yogurt is also just milk/cream and probiotics (+inulin in the fat free variety, and obviously extras in the flavored types). I haven't tried their traditional but think the FF is almost ricotta-like. I like it.